In 1963, Howard Kaplan (Kaylan), Mark Volman, Al Nichol (lead guitar), Chuck Portz (bass), and Don Murray (drums), formed a Westchester High surf group called the Crossfires in LA. After graduation, the group continued on while its members attended area colleges (picking up rhythm guitarist Jim Tucker along the way). In 1965, they found a manager, Reb Foster and he had them signed to White Whale Records. The group changed their style to folk rock and their name to the Tyrtles. Their first record was a cover of Bob Dylan’s "It Ain't Me Babe" and this reached the Billboard Top Ten. Their second single, "Let Me Be," reached the top 30, while their third hit, "You Baby," charted in the top 20 in early 1966. The line-up changed when Don Murray and Chuck Portz left and were replaced by Joel Larson and then John Barbata on drums, and Chip Douglas on bass (and producer), Chart success for the new format was elusive, despite releasing several singles. They did appear in Universal's beach party spy spoof film Out of Sight (1966), singing "She'll Come Back" on screen and this gave them wider exposure. In 1967, the group started a low profile UK promotional tour, but after Jim Tucker had a fall out with John Lennon, he left the band. Not without irony since the group’s next single, "Happy Together", replaced the Beatles' "Penny Lane" at number one on the Billboard Hot 100 later in the same year. "Happy Together" also reached #12 on the UK singles chart. Their album of the same name peaked at No. 25 in the US. The Turtles performed the title song (composed by John Williams with lyrics by Leslie Bricusse) for the Twentieth Century-Fox bedroom farce A Guide for the Married Man (1967). 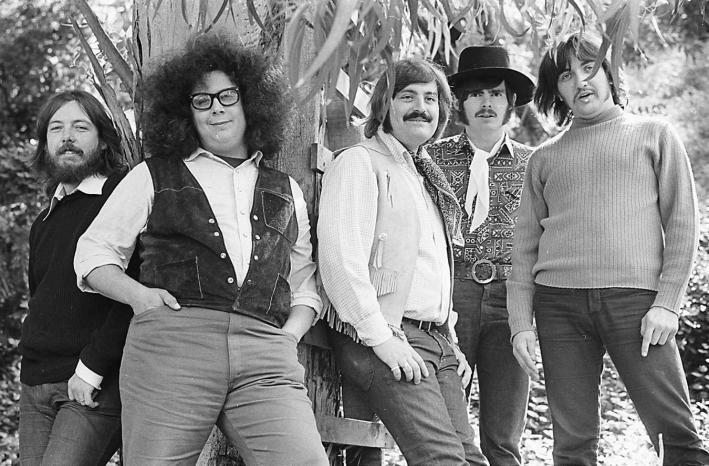 The Turtles' enjoyed more chart success with "She'd Rather Be with Me" (number 3 in US charts); "You Know What I Mean" and "She's My Girl". Chip Douglas left to work with the Monkees and was replaced by Jim Pons. The next couple of singles "Sound Asleep" and "The Story of Rock and Roll", made the lower end of the Top 100. Later in the 1968, Douglas returned to work with them in the studio and the band released a concept album called The Turtles Present the Battle of the Bands. The album yielded two top ten hit singles: "Elenore" (1968) and "You Showed Me" (1969). John Barbata left to work with Crosby, Stills & Nash and was replaced by John Seiter. Ray Davies (The Kinks) produced their next album, Turtle Soup, which was critically well-received. Notable tracks included "Somewhere Friday Nite", "You Don't Have to Walk in the Rain", and "Love in the City". The album was not a commercial success and the band soon began to disintegrate. Kaylan and Volman did not want the band to become an assembly-line pop act. However, Kaylan and Volman were encouraged by their record company to fire the rest of the band, make future records by adding their vocals to backing tracks recorded by Memphis session players, and tour with hired musicians. They recorded "Who Would Ever Think That I Would Ever Marry Margaret? ", then quickly disowned after release. Disillusioned with White Whale Records, Kaylan and Volman left in 1970 and formed their own record label, Blimp Records, and signed a few acts, including folksinger Judee Sill, who wrote the Turtles' last recording, "Lady-O." The duo did session work, and sang backing vocals on several recordings by T. Rex, including their worldwide hit "Get it On (Bang A Gong)" (1971) and the albums Electric Warrior and The Slider. White Whale Records continued to release old material the Turtles had previously recorded. Meantime, Kaylan, Volman, and Jim Pons joined Frank Zappa's Mothers of Invention (1970 – 1972). For legal reasons Kaylan, Volman appeared as the Phlorescent Leech & Eddie. Then, as Flo & Eddie, (Kaylan and Volman) recorded five LPs for themselves between 1975 and 1981. White Whale's master recordings of the Turtles were sold at auction in 1974, and Kaylan and Volman bought them back and promptly licensed the tracks to Sire Records. They issued them as a compilation. Happy Together Again. About the same time the pair started their syndicated radio show called Flo & Eddie by the Fireside, which originated from KMET in Los Angeles. In the 1980s, they began hosting their own radio show on KROQ-FM in Los Angeles and WXRK in New York City. The duo recorded soundtrack music for children's shows like the Care Bears and Strawberry Shortcake and still found time to work as session singers, featuring as Flo and Eddie on Alice Cooper's Flush The Fashion LP in 1980. They also sang backup on Bruce Springsteen's "Hungry Heart", from his album The River, and contributed backing vocals to the debut album from British new wave band Espionage titled Espionage produced by Roy Thomas Baker released in 1983 by A&M records. Kaylan and Volman regained the use of the "The Turtles" name and began touring as the Turtles... Featuring Flo and Eddie. They featured an all-star line-up of sidemen who had previously played with different groups. They continued to release compilations of the Turtles recorded works and appeared in a music video to promote the romantic comedy Making Mr. Right, (1987) starring John Malkovich, singing “Happy Together”. The song also featured in Happy Together (1989 ) movie, starring Patrick Dempsey and Helen Slater. Once again the song featured in Adaptation (2002) with Nicolas Cage. The Turtles Featuring Flo & Eddie continue to perform and remain popular on the retro circuit.